Venezuelans are starting to fall out of love with their president. Will they be allowed to vote him out of power? WITH his bellicose bombast, theatrical gestures and dodgy jokes, Hugo Chávez, Venezuela’s president for the past 11 years, has turned himself into one of the world’s most recognisable and controversial rulers. His fans salute him as a saviour for the downtrodden of the planet, a man who is leading a grass roots revolution against American imperialism and its local sepoys. But to many others, including this newspaper, he has come to embody a new, post-cold-war model of authoritarian rule which combines a democratic mandate, populist socialism and anti-Americanism, as well as resource nationalism and carefully calibrated repression. This model has proved surprisingly successful across the world. Versions are to be found in countries as disparate and distinct as Iran, Russia, Zimbabwe and Sudan. In one way or another, these regimes claim to have created a viable alternative to liberal democracy. In Mr Chávez’s case, that claim has been backed up above all by oil. On the one hand, he has deployed oil revenues abroad to gain allies, and to sustain the Castro brothers in power in Cuba. On the other, having kicked out Western multinationals, he has signed investment deals with state-owned oil companies. Last month China agreed to lend Venezuela $20 billion, mainly for oil development. 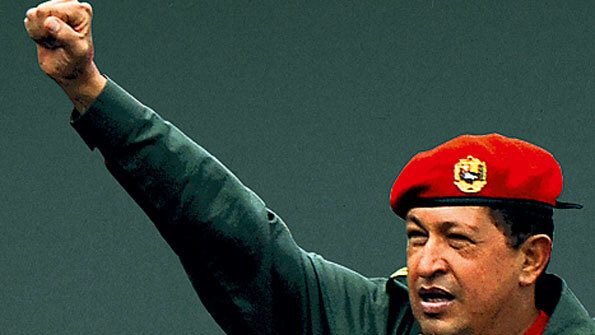 Mr Chávez has armed his revolution with Russian jets, tanks and rifles (albeit bought on tick). Meanwhile, a Spanish judge accuses his government of sheltering members of ETA, the Basque terrorist group. Intercepted e-mails from leaders of Colombia’s FARC guerrillas suggest that they have received help, and possibly arms, through Venezuela. Of course Venezuela’s government denies such claims. So just how much of a menace is Mr Chávez, and what, if anything, can be done about him? Certainly his threats against Colombia—which include a total trade embargo if Juan Manuel Santos, a former defence minister, wins this month’s presidential election—and the evidence of his veiled support for the FARC are troubling. They are a constant, if so far manageable, source of regional tension. And his efforts to build a block based on self-proclaimed “revolutions”, anti-Americanism and managed trade in the heart of democratic Latin America have served to undermine the very cause of regional integration that he claims to champion. But rhetoric aside, his influence in the region peaked a couple of years ago. He lost one ally, albeit in regrettable circumstances, when Honduras’s president, Manuel Zelaya, was overthrown last year. Several others are on the defensive. Much more important is the damage Mr Chávez is doing to his own country. His “21st-century socialism” is a precarious construction. The brief fall in the oil price of 2008-09 was enough to sink Venezuela’s economy into stagflation—even as the rest of Latin America is enjoying vigorous economic recovery. Venezuelans are suffering declining real wages, persistent shortages of staple goods (meat is the latest to become scarce) and daily power cuts. The blackouts are in part the result of drought. But they are also the most dramatic sign that the bill for a decade of mismanagement of the economy and of public services is now falling due (see article). There are plenty of other ugly portents. In one of the world’s biggest oil exporters hard currency is running short: to buy a dollar in the tolerated parallel market now requires almost twice as much local currency as the official exchange rate (and three times more than the privileged rate for “essential imports”). Investors rate the country’s debt as the riskiest of anywhere. Crime and corruption are flourishing. Awkwardly for Mr Chávez, all this is happening when he faces a legislative election in September, the prelude to a vital presidential ballot in December 2012. That points to the contradiction at the heart of his project. He sees his revolution as permanent and irreversible. But he derives his legitimacy from the ballot box. He has been elected three times, and won four referendums. He has hollowed out Venezuela’s democracy, subjugating the courts, bullying the media and intimidating opponents. But he has been unable, or unwilling, to disregard or repress opposition to the same degree as Iran’s Mahmoud Ahmadinejad or even Russia’s Vladimir Putin, let alone the Castro brothers in Cuba. Public opinion still matters in Venezuela. Remarkably, opinion polls show that two Venezuelans out of five still support Mr Chávez (higher than the proportion of the British electors who voted for the Conservative Party, the senior partner in the country’s new coalition government). That is tribute to his skill in convincing the poor that he is their champion, to the opposition’s mistakes, to years of record oil prices and to the ruthlessness with which he ransacks the economy for the short-term benefit of his supporters. It means he is unlikely to fade away. But provided that the opposition comes up with a plausible alternative, it is not fanciful to imagine that in 2012 Venezuela will face a stark choice: Mr Chávez or democracy. All the evidence is that Venezuelans, including many chavistas, are democrats and want to remain so. But Mr Chávez is pushing on regardless with his revolution, nationalising ever more businesses, expropriating private properties and selectively locking up or harassing his opponents. So the question increasingly being asked in Caracas is whether Mr Chávez’s rule will end peacefully or not. The answer will lie largely with Venezuelans themselves. But outsiders, especially in Latin America, can play their part, by urging that the opposition receive guarantees that it can take part both this year and in 2012 on equal terms. That goes particularly for democratic Brazil, whose president, Luiz Inácio Lula da Silva, has embraced Mr Chávez far more than is desirable for his own country’s long-term interest. Mr da Silva has helped entrench prosperity, freedom and democracy in Brazil. He should hope the same happens for Venezuela. Mr Chávez, unfortunately, is not the man to bring that about.